I’ve just completed a couple of tracks (bass and guitar) for internet-based Jonathan Coulton covers band ‘The Mandelbrot Set’. Cover versions are something I generally steer clear of, mainly because I have little enough time to record my own music without revisiting something that somebody else has already recorded. However, I like JC’s approach to music, and his use of the Creative Commons licence (as we used to release ‘Difficult Second’) means that people are free to record or perform covers of his songs without fear of having their arse sued out from under them. 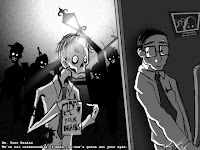 The song (about zombies in the office environment) is still a work-in-progress, but a basic mix can be found by visiting the JoCo forums at www.jonathancoulton.com and following the link from my post tonight. When it is finished I’ll stick a copy up here for easy access. The 3-for-2 offer on our CDs has now come to an end, so your chances of getting hold of a limited ‘Difficult Second’ are slim if you missed the deadline. We have a handful left that will be distributed by other channels… Most likely as competition prizes or similar. Of course, the album is still free to download via the web, and you can burn your own CD. In fact, burn a stack of them and give them to your friends!